Watching a James Wilson & Sons New American Celestial Globe go on eBay... for $3,707! James Wilson was America's first commercial globe maker. He was born in New Hampshire in 1763 and spent much of his adult life as a farmer and blacksmith in nearby Vermont. However, after seeing a pair of terrestrial and celestial globes at Dartmouth College, he decided to make his own. He began by learning geography from an encyclopedia was instructed on engraving from an experienced engraver of maps. Around 1810 he had created his first globe, and by 1818 he and his sons had established an "artificial globe manufactory" in Albany, New York, where they produced globes of three-inch, nine-inch, and thirteen-inch diameters. I haven't determined the accuracy of that description, but given my home now in Vermont and history in New Hampshire, this globe would have a certain sentimental as well as historical value. It would be quite fascinating to see the world as depicted by an American in 1834! Alas, this particular auction was a wee bit too rich for me... the winner paid $3,707 USD! The detailed 1850s road maps - with homeowner names - are now available for convenient use for the first time. We have scanned these remarkable old documents (11 county wall maps) and made them available on CDROM. He's also scanned maps in Maine, Massachusetts and New Hampshire. It's good to see someone doing this before all the maps of that era decay. The other night my wife was painting a wall and had to take the globes off the top of the hutch to move the hutch. As I sat at the table amusing our daughter with one of the globes, I did a bit of a double-take.... and then found myself quite amused. The globe in question is an older 9" Ohio Scientific metal globe of the type primarily meant for kids. I'm not particular fond of these Ohio Scientific globes, actually. Their cartography isn't overly accurate (I'm sorry, but India does not look like that! ), the colors bleed a bit and the lines vary in width - at least with the two that I have. They were probably cheap, mass-produced globes and who knows, the printing on metal may have been advanced for their time. They certainly are more durable than "regular" globes, but they just don't do a whole lot for me. Whenever you look at a globe, you always face the immediate problem of not being able to simply determine the age of the globe. For whatever reason, globe manufacturers usually do not put dates on their globes. Very occasionally, you might find one with a date near the legend or manufacturer logo, but it is a rarity. Instead, one usually must resort to the game of "find the country name/border change that most accurately estimates the date". For instance, if the globe shows the "Soviet Union", it's at least earlier than 1991. If it shows "Rhodesia" instead of "Zimbabwe" it is from before 1980. If it shows "French West Africa" occupying a significant part of the African continent, it was made before 1960. If Israel isn't there, it's pre-1948. You get the idea. 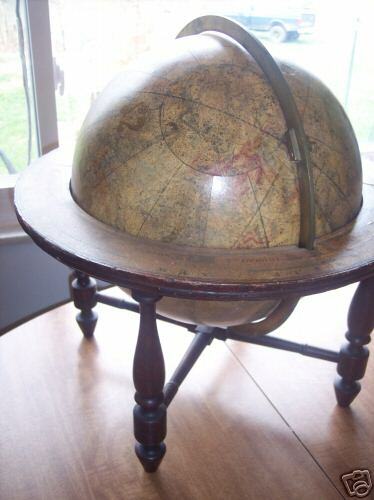 Replogle: How Old is Your Globe? George F. Cram Company: How Old is My Map or Globe? The latter two are obviously particularly useful if you have a Replogle or Cram globe. By the way, the first site I mentioned, 20thcenturyglobes.com is a great general resource for people looking to learn more about US globes from the early to mid-20th century. The site maintainer, Carolyn Burrell, has done a great job collecting information from that era. As part of my continued exploration of TypePad, I wouldn't mind experimenting with multiple authors participating in a weblog, so if you are a collector of globes and would be interested in contributing posts here, feel free to contact me at "dyork at Lodestar2 dot com" and I can set you up to post. Also at Delorme's headquarters, I picked up a Replogle "Geographer" globe primarily on the basis that it looked very cool and different from all the other globes I have. It was also nice to see that it was actually from Scanglobe, even though that is now simply another brand under Replogle. You could tell, though, that the integration of the companies isn't all that complete. The Geographer was inside a box with a dry-erase marker, a brief generic description of the features of your globe - and that was it. No mention of why the dry erase marker was in there... or anything else about this particular globe. Searching through Replogle's web site, I was able to find out that this is a globe that you can mark up and then erase. Primary target seems to be for the educational market which makes sense. Pretty neat globe, although it would be nice if they told you more about it in the box when you bought it. This past weekend we took a bit of a break to go visit Freeport, Maine, (and if you don't know why we were in Freeport, there's really only one reason (google for it)) and on the way home stopped off at Delorme's headquarters just a tiny bit south in Yarmouth, ME. It's always amazing to go there and visit the giant Eartha globe. While there, though, I of course had to visit the company store and wound up leaving with two globes. One of them was a reproduction of a Weber Costello globe, and the box was quite clear that it was a model. In fact, it turns out to be made by a company called Authentic Models who makes an entire line of reproduction globes primarily targeted, it would seem, at people who want nice-looking globes in their homes as decorations. I was scanning eBay for the first time in a while and looking at all the auctions underway when one caught my eye. It was for a 8" world globe by Terrestrial Globe, John Wanamaker, New York, Philadelphia, copyright G. W. Bacon & Co., London. Judging by the information provided by the seller, the globe sounded like it was quite old. Obviously, however, it caught the eye of a good number of other people as well. The opening price was set at $5.99 but the first bidder opened at $24 and 18 bids later the 19th bidder took it home at $616.88! Too rich for my taste right now, but there's an eBay seller out there who is very happy tonight! Welcome to "This Old Globe"
As I was preparing to post an entry to my primary weblog about some recent globe purchases, I realized that: a) these postings had really nothing to do with the other stuff I talk about; and b) it might be a nice excuse to try out TypePad and the new ecto offline client I'd like to try. When I found that "thisoldglobe.com" was available, it was just too much, so here I am with yet another blog. So, welcome! My name is Dan York. I've been blogging for over 5 years and using the Internet in one form of another for about 20 years. My main blog is http://blog.danyork.com/ and you can find other information about me at http://www.danyork.com/. Somewhere along the way, I started to collect globes and now have about a dozen or two floating around the house in various sizes and conditions. As a long-time lover of maps, it's a fun hobby and quite interesting and educational. (Did you know that the Italians once controlled part of Eastern Africa? I didn't, but do now.) In this blog, I intend to merely write down some of the things I see and learn about globes... and perhaps about some of the interesting ones I find as well. I don't know how often I'll update it... time will tell. In the meantime, enjoy! mamachele2002 on Watching a James Wilson & Sons New American Celestial Globe go on eBay... for $3,707!